CloneApp is a small, fully portable utility for computers running Microsoft Windows 7, Windows 8.1 and Windows 10, that’s designed to easily backup and restore Application settings and Windows configuration settings that are stored in Windows directories, profile folders and the Windows registry. It can also backup User profiles, including the Pictures, Documents, Music folders in the User’s profile. “A fresh re-install always makes Windows much faster, but that means you lose all your program settings. CloneApp will Backup all your App settings from Windows directories and the Registry and only those you really need. The Idea behind is a bit different from the “classic” Backup tool. The Main purpose is to backup ONLY the Configuration files left in Windows Program directories and the Registry. CloneApp creates Application backups of a different kind. Instead of completely backing up all files of a program or even a complete Windows partition etc., CloneApp will Backup ONLY the Configuration files of an Application itself from Windows directories and Registry. This is quick and save a lot of space, but it’s not a substitute for backing up your personal files and folders. CloneApp currently has about 100 programs it can back up configuration files for – Firefox and Chrome among them. Additionally, you should read CloneApp’s extensive documentation if you want to get the most out of the program. However, most of you are not going to plow through all that, so you’ll be glad to know the program is easy enough to use even if you don’t read the documentation. CloneApp backs up ONLY the Configuration files which the developer claims more secure than backing up entire partitions. He says, for example, if your system was compromised or damaged by malware, user errors, or a bad Windows installation, CloneApp makes it easy to keep your current Windows and program configurations so when you reinstall Windows and your programs, your configuration and windows settings are saved, and this saves you time and trouble if you ever reinstall Windows or get a new PC. CloneApp is not a substitute for keeping good backups tough. But it can a part of complete backup regimen. And even though CloneApp app can backup your complete User Profile (Pictures, Documents, etc.) you should always make sure you keep another backup of your personal files and folders – everything you can’t easily replace should be backed up. If you’re using Windows 10, we recommend that you make sure you have an external hard drive and that you turn File History on. 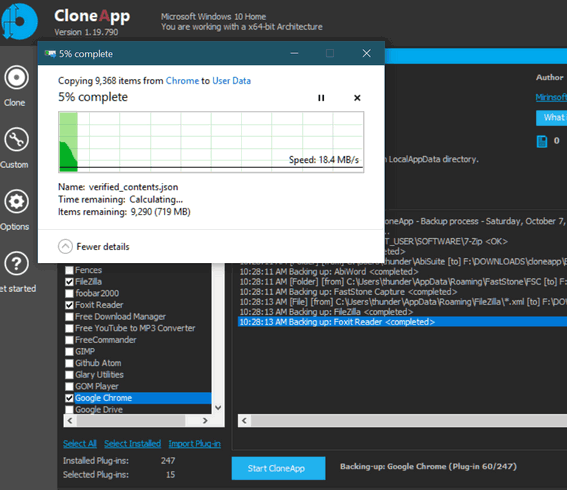 CloneApp can save you time if you need to reset your Windows 10 PC, or reinstall Windows, by allowing you to save your application configurations and Windows settings making it much faster to set up a computer on which Windows was reinstalled or if you get a new computer. Keep in mind, you”ll still need to reinstall your applications and that CloneApp does not save configurations from all programs. You can read more CloneApp here . Also be sure to check out the growing number of plugins for CloneApp which extend its usability. For simplicity it’s easier to download CloneApp from Major Geeks. CloneApp comes in a zip file – portable application. Just unzip and run CloneApp – no installation needed. There is no information about where this backup is filed. The program provides excellent documentation. You choose where you want to store your backup, like you do for any backup. Please check the program’s page if you need more info.